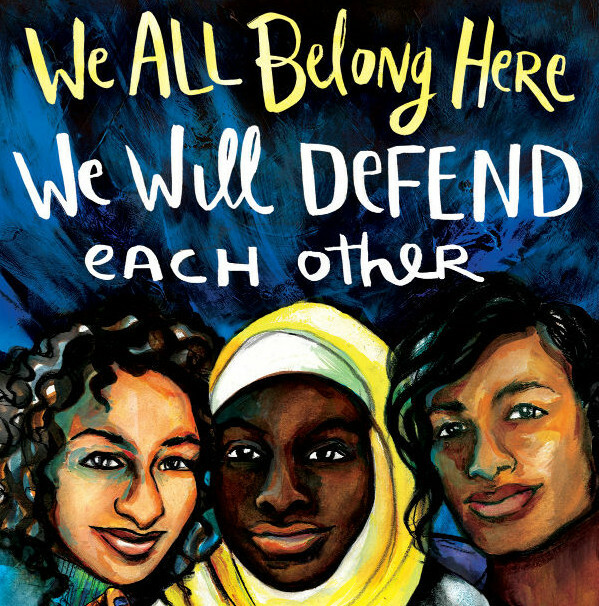 Share and display these images in your community to help create welcoming spaces for all. Between Nov. 9—the day after the presidential election—and Nov. 15, the Southern Poverty Law Center collected 437 reports of hateful intimidation and harassment from around the country. Muslims, immigrants, women, and Black and LGBTQ communities were all targets of these attacks. These incidents took place on public transportation, in the streets, in places of worship—but the majority took place in K-12 schools. These attacks are happening to our communities, our friends, and loved ones. Driven by a desire to provide tools for schools and the larger community to create space for discussion and declare solidarity, artists Micah Bazant and Kate DeCiccio partnered with AFSC, Forward Together, Jewish Voice for Peace, Center for New Community, and Showing Up for Racial Justice to produce these beautiful images. Post them in schools, community spaces, businesses, etc. to assert anti-racist, welcoming spaces. Download these images for free below. Use these images along with our crowd-sourced K-12 discussion and activities guide. This guide is a collective work in progress. Let us know if you have an activity to propose. 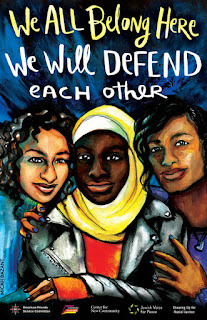 Use these images with a new video called Don't Be a Bystander: 6 Tips for Responding to Racist Attacks, or incorporate it with toolkits and materials prepared by groups across the country, including this guide "Do's and Don'ts for Bystander Intervention."